Blessing: The Muses preside over the arts and sciences, giving inspiration to all artists, particularly poets, painters, dancers, musicians, philosophers, and astronomers. Names and Symbols: The Delphic Muses were the daughters of Apollon. Traditionally three in number, they are named Kephiso, Apollonis and Borythenis; or, alternatively, Nete, Mese and Hypate. They represent (or were represented by) the three strings of the lyre. The Titanic Muses are three or four in number. They are Melete (practice), Aiode (song), and Mneme (memory). 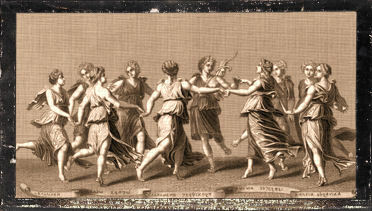 The last of these is usually equated with Mnemosyne, the mother of the nine Olympian Muses. Cicero offers an alternative name and number scheme in Thelxinoe, Aiode, Arkhe, and Melete. Ways to honor: Create! Learn a new art form. Go to museums, theaters, dance recitals, and other places of culture. Support artists. Give money to street musicians or painters. Turn a child onto art.